The perfect school organizer for every student. iHomework 2 provides you with all the necessary tools to make you the ultimate student. 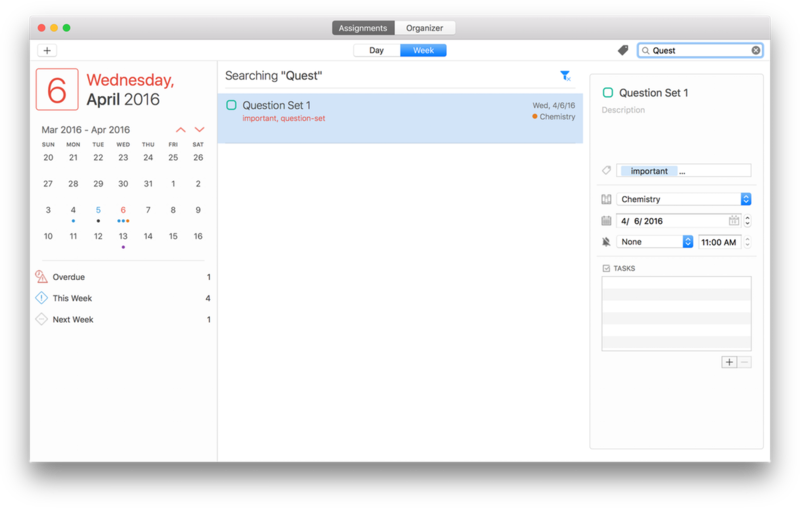 The iHomework 2 Planner organizes Assignments by when you can work on them - not just by their due dates. Plan more difficult Assignments multiple days in advance so you don't have to pull another all nighter and save the easier tasks for later in the week. Use Assignment effort to estimate just how difficult a task is to complete. Try and balance a day's work and keep your goals within reach. Create and manage your Assignments with all of the details you need to stay ahead of the curve. Use quick filters, tags, and search to quickly find the big exam coming up. Break down Assignments into smaller Tasks. Get all the satisfaction of being productive but with less of the effort. The Organizer helps you keep track of your current and past Courses. 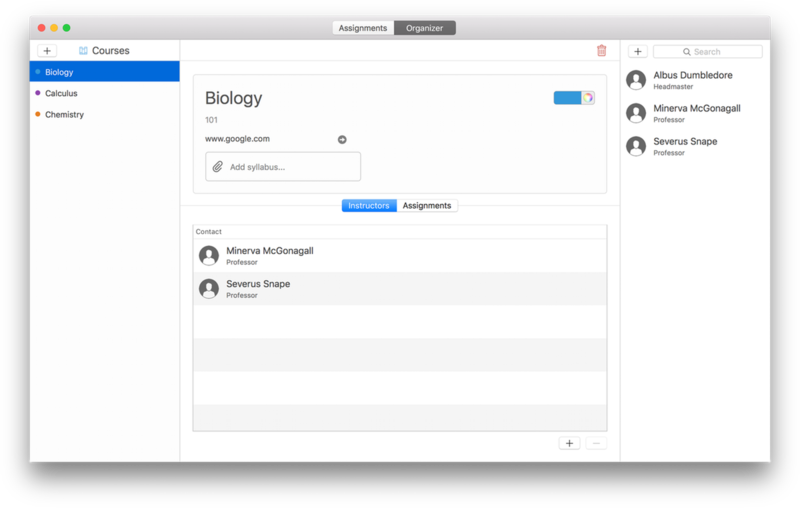 Double check a syllabus without ever leaving the app. Your Instructors are pretty awesome people. Why not send them a quick email? Just don't bother them too often! Keep track of your grades as you complete Assignments. Customizable grading scales and grade weights allow you to represent your grades exactly how your teacher does. As you progress through the semester, Grading Insights give you a high level picture of your progress. 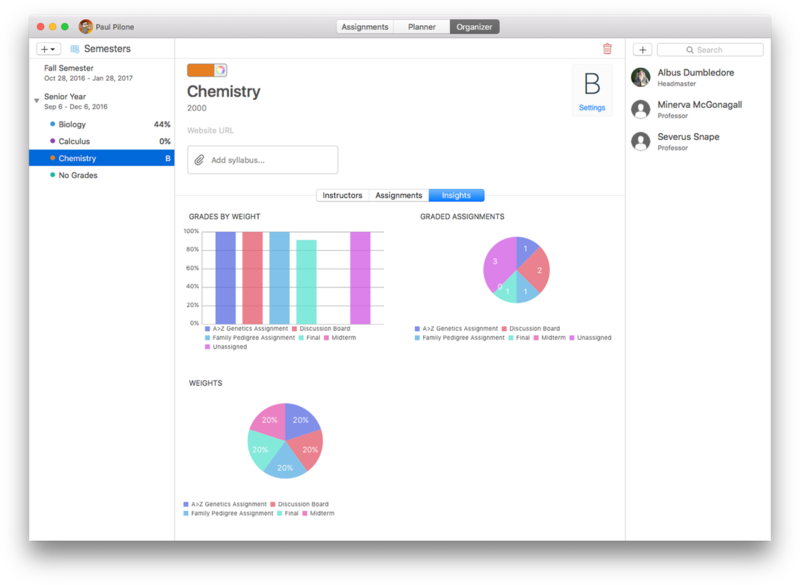 Grade Insights are presented in easy to digest graphs that give you a quick snapshot. Enjoy all of the benefits of iHomework by subscribing to iHomework 2 Premium. Easy access from any device and attend class knowing that your information is backed up and secure. Subscribe for 1 year or 6 months. Renew or extend your subscription at any time. 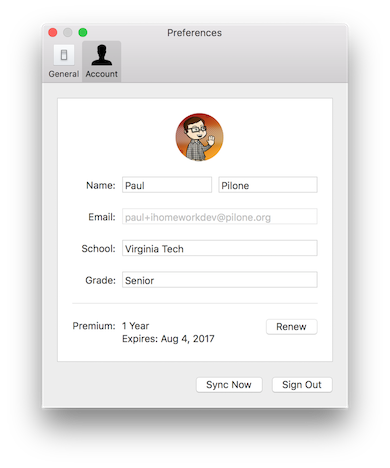 Premium subscriptions are a great way to contribute towards the future development of iHomework 2.
iHomework 2 is available on iPhone, iPad, Apple Watch, and macOS. Download for iOS and macOS to seamlessly sync between all of your devices. Impress your teachers and be a student superhero.